Did you know that Halloween is the second most decorated holiday? Pre-paint birdhouses with black primer or spray paint. Allow time to dry. If you want to create a pattern, add stripes or other desired patterns to the birdhouses with masking tape. I striped one of the roofs. Spray the birdhouses with Krylon Glitter Blast spray paint. Allow time to dry. Remove masking tape. Approximate project time: 1 hour. For more Halloween decorating inspiration, visit yourholidaystyle.com, offering tips, tricks and inspiration to help you spook your family, guests and trick-or-treaters. Ideas abound at Krylon and they have so many sites to help you get your DIY on! Click below to be taken directly to their site to be inspired! Use your knife to cut a hole in the top of your pumpkin. If its hollow you’re done with this step! If its not, carve out hole for your flowers to set in. Apply 2 coats of spray paint to the pumpkin. Allow to dry. If using real flowers, place a cup to use as a vase inside the pumpkin. Trim flowers to fit in pumpkin and arrange. This week Krylon will once again sponsor and judge the CSI Project with the challenge of “My Painted Halloween.” They will give three lucky CSI participants a 6-pack of their choice of Krylon spray paint. Get ready to spray away as you prep for this week’s challenge, Painted Halloween Projects. The linkup will begin Wednesday, October 12th at midnight (EST). Great projects – much buy glitter paint! 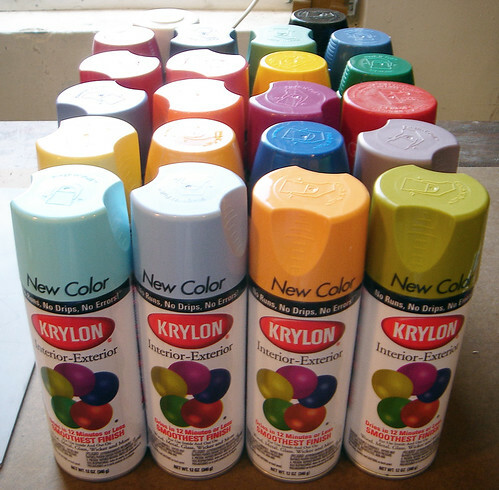 Oh I love Krylon, New colors and glitter paints, my heart just skipped a beat! lol. Love me some Krylon paint!